Imagine that your life exists for just one moment. In other words, that you were conceived and died at the same moment. There would be no past. There would be no future. Life would be just one moment in duration. If that were the case you would have a point of view within space. The point of view would be conscious awareness. Surrounding space would be memory. Time is not a factor because everything takes place within that moment. As afterlife happens conscious awareness goes to zero. It no longer exists. What was, prior to death, a point of view within space now becomes a “space” of view. The consequence of conscious awareness going to zero is for it to become memory. For example without conscious awareness your point of view would be allowed to move about in memory. Rather than your point of view being at the center of the universe, it would now be able to be at the edge of the universe. When this happens you would be on the edge of your universe looking down at what was formally the center of your universe. That is the basic idea however that is not enough. The idea of having your point of view move about in space is not accurate. What happens in afterlife is you become multiple points of view. Rather than having a single vantage point, as during life, you now have multiple vantage points. What happens in afterlife is you become multiple vantage points within space so that you now have an individual and unique vantage point for every point within your space. What was formally a point of view no becomes a point of view for each point within the universe. As humans, it is hard enough to imagine being in two places at once. It is hard to imagine because it never happens during life. In afterlife, not only are we in two places at once, we are everywhere at once. We have a point of view for each point within our universe. This equates to an explosion of awareness throughout space. Simply by having conscious awareness going to zero causes awareness to explode throughout memory. We will be everywhere at the same time. Conscious awareness is our location within the universe with respect to length, width, depth. During life we exist at a specific location within space. In like manner we also exist at a specific point time. We are located in the present. The present is a point in time. Putting time and space together, we are located at a specific location within our time-space continuum. Conscious awareness has a single point of view with respect to both time and space. We are only in one location in time and space at a time. Nothing changes when you add time to the conscious awareness side of the equation. We live in the present. 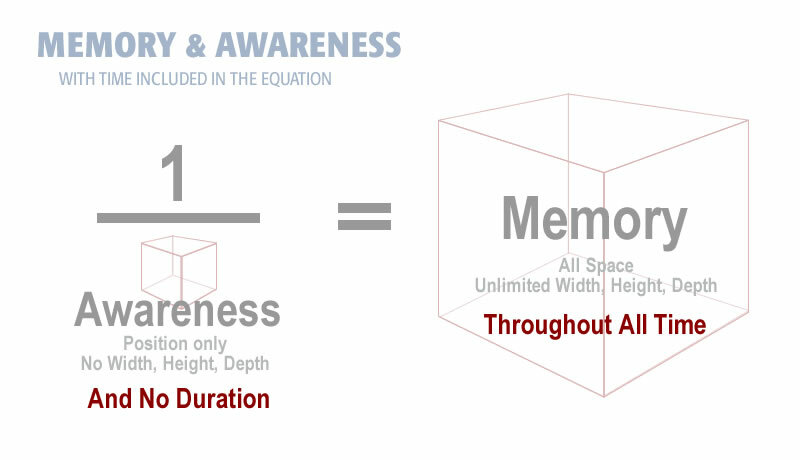 Conscious awareness is a geometric point with time and space. Looking at the left, memory, side of the equation requires looking at depth in time. Our initial equation is a point of consciousness within a memory of space. For the equation to hold true, conscious awareness must be a point within time. It turns out that it is. Conscious awareness exists at a point in time. It exists in the present. This is what the equation predicts. This is what we have. For the equation to hold on the left, memory, side of the equation memory would have to exist throughout time. This is what the equation predicts. When you look at this objectively, we can see the left side is memory. Memory means time. It is more than coincidence that the equation predicts depth through time and what is there is memory. The equation predicts depth of space throughout time. The left side is a time-space continuum. Put another way, the left side predicts the universe. What is there practically is memory. For the equation to hold memory would have to equal a time space continuum. Memory would equal the universe throughout time. The ratios, from right to left, are complete and total. The equation predicts a change from a point in space on the left, to all space on the right. Likewise it predicts a change from a moment in time on the left, to all time on the right. This is a complete and total change of dimension of awareness. That means that memory is predicted to be all of space and all of time. Memory is predicted to be a universe without bounds on all sides. The predicted value of memory appears to be at odds with reality. Even if memory was perfect, one could argue, it still does not contain all time and space. It only contains all time and space relative to the individual. The equation does hold true because reality is relative to the individual. Unlimited space, to you, is the space around you now. Mathematically it matters not what is on the other side of the moon. Similarly with time, it matters not what happened in 100 BC. All time, relative to you, is the time you have been alive. When you view the equation, relative to the individual, it holds true. The equation predicts awareness during life, and it holds. It also predicts awareness in afterlife, and that holds as well. Physical reality matches the predicted results. Sitting out in space looking down at the apex of the pyramid, awareness looks incredibly small. Here we are, in the vast universe, looking way down below at a tiny pyramid. The exact apex is a single point shining out in the universe. It is so far away we can barely see it. Then you realize that single point is you. From our vantage point amoung the stars, the point of awareness is just one point in a vast universe. We are not at the center of our universe anymore. Our point of awareness is just one of billions of points that make up the universe. There is no difference between our awareness during life and any other point in the universe. On the last moment of life conscious awareness stops. When it stops, we become memory. Awareness goes from being a fixed location to expand throughout time and space. In afterlife awareness is memory. Memory is all time and space. At the end of life, a single moment in time becomes all of time. Similarity a single point in space becomes all space. The physical body is no factor as afterlife is just one physical moment long. We do not exist in time even one moment past at the end of life. Yet we exist in all time simultaneously. At end of life we are in the presence of time itself. You have every moment throughout your lifetime with you. It is all there. It has been all along. Time and space has been filed away in memory. You are in the presence of unlimited time and space in your memory. Awareness is not confined to location in afterlife. It explodes. Awareness undergoes a change of dimension. Rather than being at one location within time and space we are at all locations within time and space simultaneously. It is impossible to comprehend what this may be like. During life we exist at a location. The inverse of that is to exist at all locations simultaneously throughout time and space. What this represents is an explosion of light throughout the universe. Awareness goes everywhere throughout space and time. You will experience everything at once. You will be with everybody at once. You will experience all emotion. You will be all knowledge. You will be all life. The kingdom of heaven lies within. This concludes Proof of Afterlife by Geometry.